The botanical motifs on the handcrafted enamelled artwork beautifully ties in with the freshness of the menu that Ummrao offers. Courtyard by Marriott, Mumbai has revealed their brand new step into royal elegance with a picturesque new project, Ummrao brought to life by Studio HBA. Studio HBA has worked hard and fast to create a royal atmosphere without the clichéd ethnic setting of an Awadhi Restaurant. Ummrao aims to bring in the elite into their premises to experience a unique “Majestically Urbane” dining escapade between the hustle and bustle of Mumbai’s city life. “The success of any project is dependent on the canvas we are given. In the case of Ummrao, we had a lot of interesting details to work with. The challenge of converting the asymmetrical space into an eye-pleasing and inviting symmetrical one was something our team was excited to take up,” shared Abhishek Mathur, Director, Studio HBA - Mumbai. Ummrao is designed in a palette of warm colours that balances the glamourous elements perfectly. The botanical motifs on the handcrafted enamelled artwork beautifully ties in with the freshness of the menu that Ummrao offers. “For the project our team has studied old palaces of India and infused it within the look and feel of the space. Courtyard by Marriott has always been a pioneer in terms of innovative thoughts and it was a fabulous experience collaborating with them on the project,” added Mathur. Lighting was an integral part of the design strategy and offers a moody and dramatic ambience which is punctuated with accents of decorative lighting. 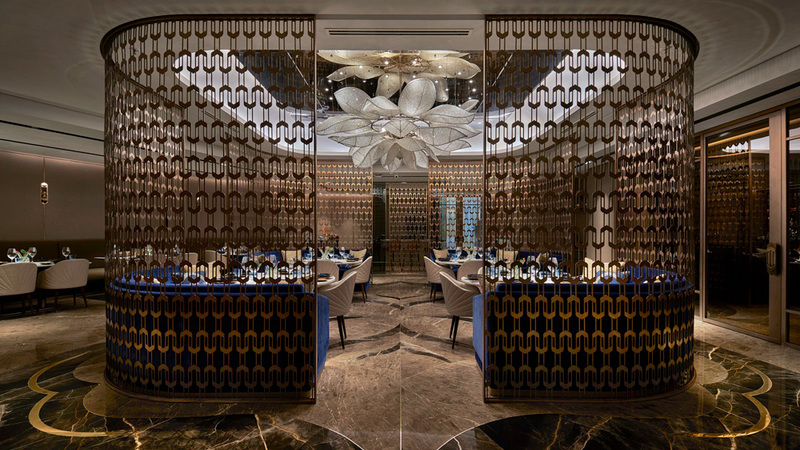 Perhaps the most elegant detail of the restaurant is the glowing lotus chandelier that acts as the perfect finishing touches while the gem cut mirrors on the wall provide an edge to the traditionally designed space. Studio HBA’s notable projects include Trump Tower Show Flat in Mumbai, Conrad Bangalore, Six Senses Spa Club Mumbai and LodhaWorldone Marketing Suites in Mumbai.